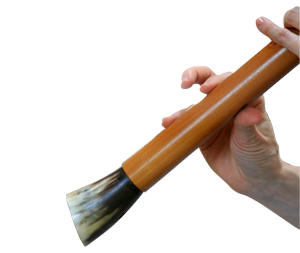 The birbyne is a traditional instrument found only in Lithuania. A member of the clarinet family, it has a single reed attached with a tightly wound string, and is typically made out of maple or cherry wood cured in hot flax oil or resin. The lower end is fitted with a flared cow horn. Though there are various models, the most commonly used modern version has ten finger holes (including holes for both thumbs!) and a brass register key. The bore is neither quite cylindrical nor quite conical, which allows the instrument to overblow at an unprecedented tenth. These physical traits have resulted an instrument capable of producing a warm rich sound closer to a human voice, an Asian flute, or an Armenian doudouk than to any sort of European single reed instrument.